A new official standard has been published by Water UK which will make it easier for consumers to tell whether wet wipes can be safely flushed down the toilet, representing a major victory in the fight to prevent ‘fatbergs’. The recent discovery of a so-called ‘fatberg’ – a 64-metre lump of congealed fat, cooking oil and wet wipes – in the sewers beneath the Devon seaside resort of Sidmouth serves as a reminder of the dangers of flushing non-degradable wet wipes down the toilet. The grisly find coincides with the publication of a new official standard by Water UK, the organisation that represents the water sector. The guidance means manufacturers whose wet wipes pass strict scientific tests will be able to display a ‘Fine to Flush’ logo on their products, indicating that they are free from plastics that don’t break down in the sewage system. The Sidmouth fatberg – which is longer than six double-decker buses – was found by workers conducting a routine inspection of the town’s sewers. It is just the latest example of a growing problem across the UK; a 250-metre, 130 tonne fatberg was found in London in 2017, and took workers nine weeks to remove. There are some 300,000 sewer blockages a year in the UK, costing the country £100m. Wet wipes, which include baby wipes, are behind a significant proportion of these – and are estimated to comprise 93% of the materials found in fatbergs. Commenting on the new ‘Fine to Flush’ standard, Water UK Chief Executive Michael Roberts said: “This is an important step in the battle against blockages. We’ve all seen the impact of fatbergs recently, and we want to see fewer of them. 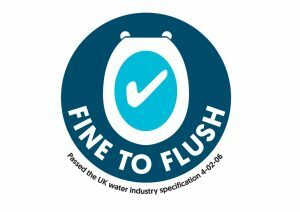 The technical name for ‘Fine to Flush’ is Water Industry Specification (WIS) 4-02-06.